Who left cinematic impressions profound. “We’ll do that in English for our Western ears. With quite the ensemble headlined by Yul Brynner. But even those westerns were just a prelude. By making the samurai brave gladiators. Then back to Japan for an anime version. The most recent role that this formula’s played. But would Kurosawa, I wonder, be biased? I haven’t done one of these Version Variation posts in a while, mainly because I haven’t watched an abundance of remakes lately. Yet I stumbled upon the 2016 remake of The Magnificent Seven, and finding it to be an above average western, had to see how it compared to the more celebrated original (not to mention how it compared to the original original, 1954’s Seven Samurai). Of course, Akira Kurosawa started it all with Seven Samurai, the tale of seven disparate but skilled misfits recruited by desperate villagers to fend off invading bandits. 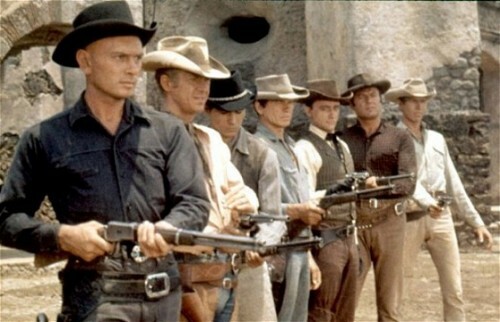 The Magnificent Seven is very much the same tale, simply transplanted from feudal Japan to the mythic American West. 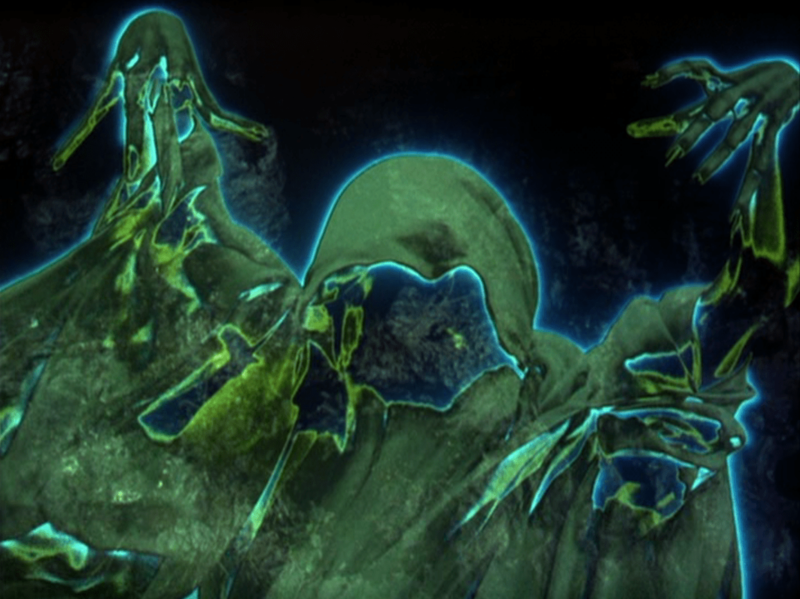 Certain scenes and plot elements are common to every version, such as the duel that introduces the most deadly of the bunch or the number of the seven who are killed by the end (though which characters die seems to differ). All three also feature extremely talented ensembles, led by an established movie star. In the case of The Magnificent Seven, that would be Yul Brynner (1960) and Denzel Washington (2016), both dressed all in black and oozing enough self-confidence to recruit six others with minimal effort. Watching the different versions, it was interesting to pick out the parallels between the other characters. Horst Buchholz (who went on to appear in Life Is Beautiful) plays a scrappy upstart in the 1960 version, clearly modeled after Toshiro Mifune in Seven Samurai, but there’s not really an equivalent character in the 2016 film. As the second recruit, Chris Pratt seems comparable to Steve McQueen’s drifter, while James Coburn’s knife-thrower is unmistakably akin to Lee Byung-hun in the remake. Other comparisons are a little harder, such as Ethan Hawke’s war-haunted Cajun in the remake having elements of both Robert Vaughn and Brad Dexter’s characters in the original. One thing that is self-evident about the 2016 remake is its effort to be more inclusive in its representation. While all of the original seven were white, the new seven include three whites, one black, one Mexican, one Native American, and one South Korean (who I guess is supposed to represent the Chinese? I didn’t know there were Korean immigrants in the Old West). Another difference is that the characters in the remake are given far more colorful names; after all, aren’t “Goodnight” Robicheaux and Billy Rocks cooler sobriquets than Britt or Chris or Lee? While it makes the character comparisons a little harder, the racial changes aren’t unwelcome and don’t make much difference storywise, aside from a clash between the Native American member of the Seven (Martin Sensmeier) and his counterpart on the bad guy’s side (Jonathan Joss, who surprisingly also played Chief Hotate on Parks and Recreation). 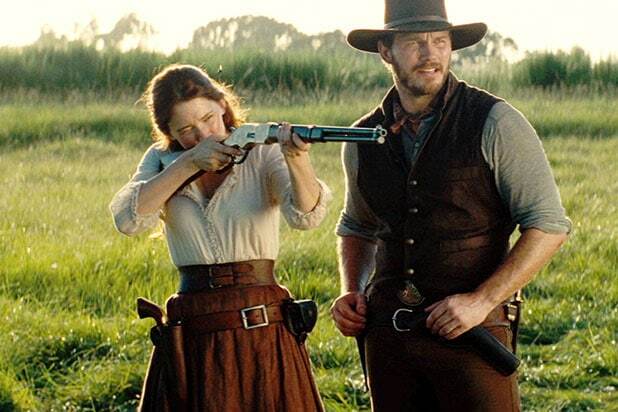 Speaking of bad guys, that’s another major change; whereas the original’s Eli Wallach played the leader of a Mexican outlaw band, the remake’s Peter Sarsgaard plays a ruthless businessman aiming to buy out the townsfolk for the nearby gold mine (which is notably not in the original, much to Brad Dexter’s chagrin). Perhaps it might have been different if I had watched the 1960 version first, as most cinephiles did, but I think I actually prefer the 2016 version. The 1960 film is a classic, no doubt about that, with Yul Brynner’s man in black standing up as one of the quintessential western heroes. Yet even though that film has its fair share of gunfights, the 2016 film plays out much more like an action movie, tossing out the love subplot and apparent defeat of the original in favor of bigger and more explosive battles. The body count is higher, but the thrills don’t disappoint, in contrast to the original film’s excessive length and occasional boring parts. That being said, cheating though it may be, I don’t have any problem grouping the two together for ranking purposes, or even grouping both with Seven Samurai. Seven Samurai may be the most artistic and the 2016 film the most entertaining, but all three are worthwhile. (I’ll draw the line, though, at grouping them with A Bug’s Life, which is also basically the same story. I did like how Charles Bronson’s bond with some local kids was recycled for Francis the lady bug in Pixar’s film.) Many may scoff at the mere idea of remakes, often rightfully, but, like A Star Is Born, this is one story that has endured the test of time and excelled in multiple incarnations. Were questing for the Holy Grail. Because they liked to dance a lot. And knights called green ere green was cool. Don’t read it; watch the film, you fool! Well, I’ve gotten 2019 off to a slow start as far as this blog. I’m already behind on my Blindspots, but it’s time to get started. So why did I select Monty Python and the Holy Grail as a Blindspot pick this year? I thought it was about time that I see the source of lines like “It’s only a flesh wound,” which has creeped into the everyday speech of even those of us who haven’t seen this classic comedy. Honestly, there are so many well-known scenes from this irreverent British farce that I just wanted to see whatever connected them. (Note that the Killer Rabbit of Caerbannog made it onto my Top Twelve Rabbits in Movies even before I’d watched the full movie.) Plus, I came to realize, although I’ve seen the likes of John Cleese and Michael Palin, I’ve never seen the whole Monty Python troupe together as they are in their first film, each of them playing multiple varied roles. 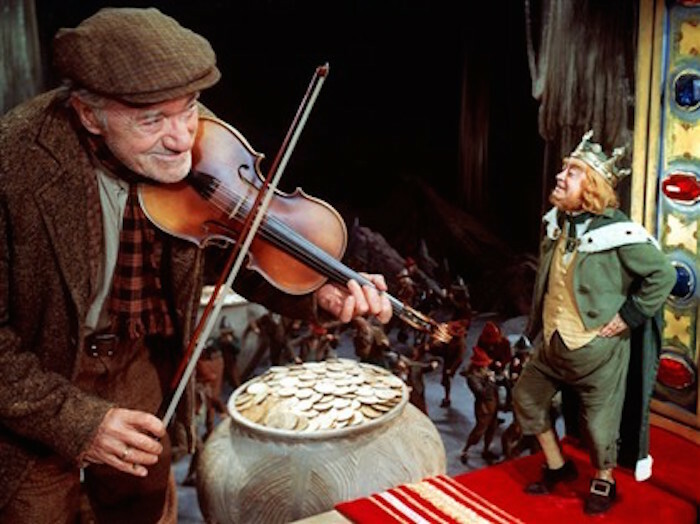 While I was a little disappointed that there wasn’t much connective tissue between the individual memorable scenes apart from King Arthur’s quest for the Grail, there were plenty of chuckles to go around. Sometimes it was random meta moments like escaping from an animated creature because the animator keeled over or even more random gags that became funnier with repetition. Some of the jokes do go on too long, losing their humor in the process, but even this weakness often becomes another chance for the film to poke fun at itself. (“Get on with it!”) I also got to recognize moments that have been borrowed in other media, like the way the Knights’ Trojan Rabbit is heard being constructed in the woods. And temps for different types of skis? Have you thought of it or not? Yes, that’s right! Some like them hot. Which one are you, I’d like to know? Well, I’m still trying to catch up on my Blindspots, and since it’s been hot as blazes outside lately, Some Like It Hot seemed like a good choice for my next review. (For the record, I do not like it hot. I can’t wait for fall.) This is one of those classics among classics that it just seemed more and more wrong that I, as a movie lover, hadn’t seen it yet, which is exactly what this Blindspot series is for anyway. Now that I’ve seen it, I can recognize its special place in the pantheon of comedy, but there have been plenty of funnier movies since. I don’t mean to badmouth a classic, since that is what Some Like It Hot is. Starting out more like a gangster movie than a comedy, the film follows the misadventures of two musicians Joe (Tony Curtis) and Jerry (Jack Lemmon), who keep finding themselves at the wrong place at the wrong time. When they happen to witness a mob massacre by the vengeful “Spats” Colombo (George Raft), they escape Chicago by dressing as women, calling themselves Josephine and Daphne, and joining an all-girl band on their way to Miami. Of course, things get inevitably complicated when Joe becomes attracted to fellow bandmate Sugar (Marilyn Monroe) and a millionaire (Joe E. Brown) improbably falls for Jerry. I guess crossdressing is just inherently funny, at least in the movies. That’s what the AFI seems to think, placing Some Like It Hot at #1 on their list of top 100 comedies, with Tootsie right behind at #2. (Incidentally, Mrs. Doubtfire is at #67, and I love that one more than either of the others.) While Some Like It Hot had me consistently amused, especially once Curtis and Lemmon donned their feminine alter egos, I find it laughable that this would be considered the best comedy ever made, much less one of the greatest films overall. Certainly, there are elements I can tell have influenced comedies since, such as Joe’s rush to change between his male and female clothes, much as Robin Williams did 34 years later. However, Joe does this in order to fool Sugar into believing he’s her wealthy dream man, which begs the question of how he thought he could get away with such a ploy in any lasting way, and his dishonesty not only makes the runtime a bit too long but is also blithely ignored when the truth comes to light, in contrast to the collective shock at the end of Tootsie or Mrs. Doubtfire. Lemmon, on the other hand, gets the best comedic scenes, sometimes struggling with his “femininity,” while other times losing himself in character. As shameful as it is for a cinephile to admit, this is actually the first comedy I’ve seen of director Billy Wilder (I’ve at least watched his The Spirit of St. Louis) and the first film starring Marilyn Monroe. Wilder’s direction is beyond reproach, and he includes a few clever cinematic touches, like the repeated shots of “Spats” Colombo’s shoes to portend the approach of danger. Monroe had a greater challenge, though, since I had always associated her with her short-breathed, dumb blonde persona (which my VC can’t stand, for the record), but I was pleasantly surprised by her and her musical moments. Despite being a gold digger, her portrayal of Sugar was hardly one-note, even expressing weariness at her own “dumb blonde” proclivities, and I’m now much more interested than before in exploring her other iconic roles. While I wouldn’t call Some Like It Hot the amazing movie it is commonly considered, it was still a good one and worthy to be called a classic. I finally got to understand the context for many familiar clips, such as the famous last line and that grating “poo poo pee doo” song parodied so perfectly by Ginger on Gilligan’s Island. So, complaints aside, I’d call this a successful and long overdue Blindspot pick. By the way, did you know it’s based off a 1935 French film called Fanfare of Love? I guess that’s another film I’ll have to check out for comparison’s sake some day. Experienced more than the lessons now taught. Or the bloody-badged heroes on some foreign shore. That freedom must be paid in sacrifice first. I couldn’t let July 4th pass without reviewing a patriotic war movie, and since I’d seen it once a long time ago, Midway seemed ripe for a rewatch. One of the last big war films of yesteryear, Midway distinguishes itself less in the story department than in its in-depth overview of the battle and its sprawling cast of famous faces. If you’re looking for some gritty war story with non-stop explosions, this isn’t the film for you. Midway is far more interested in the build-up and strategy of the battle and spends most of its 132-minute runtime on the set-up. Certainly by the end, there are scout planes being sacrificed and battleships defending themselves with barrages of skyward gunfire, but we also get to see how the Americans deciphered Midway as the coded Japanese target, how unexpected illnesses and bad luck brought certain players to the fore, and how each side endeavored to figure out the others’ movements before it was too late. All the background information isn’t exactly boring, but it can get a bit dry…yeah, that’s the word. Yet what it lacks in dynamic entertainment, it makes up for in the sense of getting a comprehensive reenactment of how events played out at a time when the American forces were still on the defensive and sorely in need of a victory. Midway’s greatest strength is its multitude of familiar actors. Just reading the cast list is a who’s who of both big-name stars of the time and some stars to be: Charlton Heston as Captain Garth and the de facto main character, Henry Fonda as Admiral Nimitz, Robert Mitchum as Vice Admiral Halsey, Hal Holbrook, James Coburn, Glenn Ford, Cliff Robertson, Glenn Corbett, Robert Wagner, Erik Estrada, Tom Selleck, and Dabney Coleman (five years before starring with Henry Fonda again in On Golden Pond). That’s not to say all of them get much time to shine in their cameos; I’m not sure Robert Wagner even spoke at all, but it’s always fun to try and pick out someone you might recognize. Of course, not being as familiar with TV of the ‘60s and ‘70s as my mom or grandfather (who loved this movie), I’m no doubt missing out on the full “look-it’s-so-and-so” experience. In addition to all the western actors is a collection of pretty much every actor of Japanese descent known to American audiences back then (except Mako; where the heck was Mako? ), most notably Toshiro Mifune of Rashomon and Seven Samurai fame as Admiral Yamamoto, whose voice was oddly dubbed by Paul Frees. There’s also James Shigeta of Die Hard, Pat Morita of The Karate Kid, Robert Ito of Quincy, M.E., and quite a few others I’m sure I’ve seen on M*A*S*H before. Unlike modern war movie trends, all the Japanese characters speak convenient English, but there’s no effort to demonize them beyond some references to Pearl Harbor. They are simply the opposing side in this life-and-death game of Battleship. Questions of prejudice are raised with the romance of Edward Albert as Heston’s son who falls in love with a Japanese girl (Christina Kokubo), but that story doesn’t get much closure by the end and is present simply to add some human interest to the film. It’s interesting to note that, despite being a box office hit, Midway is something of a black sheep among war classics, largely because it borrowed many scenes from other films, perhaps to save money on a budget that likely went to casting its prestigious stars. The graininess of certain shots clearly marks them as actual footage, but many of the actual battle scenes are from films like Tora! Tora! Tora!, Away All Boats, and Battle for Britain (at least according to Wikipedia), which now makes me curious to see all those films and spot what was borrowed. Even if its parts were cobbled together to some extent, Midway thrives on its star power and paints both a broad and detailed picture of a decisive World War II battle. On this 4th of July, whether you celebrate it or not, I want to wish all my readers, both foreign and domestic, a Happy Independence Day! Let freedom ring! And doubts that dwarf the likes of Thomas. By ghosts we thought we’d left behind. When hearts go home without the mind. This post is by request of MovieRob, who gave the most correct answers to my new banner challenge and so earned the right to have me review a film of his choice. It’s also a chance to review something not from the last couple years, which seems to be all I’ve been reviewing lately. I knew The Best Years of Our Lives was one of his all-time favorites, and it is a film that still packs an emotional wallop even 72 years later, offering an authentic glimpse of how World War II veterans readjusted to civilian life. Perfectly timed when it came out the year after the war ended, The Best Years of Our Lives follows three ex-servicemen returning to their fictional hometown of Boone City: an older sergeant and banker named Al Stephenson (Fredric March), a newly married captain named Fred Derry (Dana Andrews), and an amputee from the Navy named Homer Parrish (real amputee Harold Russell), who lost both hands and now uses a pair of hook prosthetics. Although all are eager to return home, they quickly experience difficulties in adjusting to their new civilian roles, such as Fred’s lack of experience in anything but the bombing for which he was trained or Homer’s insecurity over how his family and sweetheart will react to his hooks. The performances are excellent across the board, rarely falling into dated overacting, with Russell especially standing out as Homer, well deserving his Best Supporting Actor Oscar despite not being a professional actor. (He’s also the only actor to win two Oscars for the same role, one an honorary award, and the only one to auction his Oscar years later.) March also won an Oscar, though I personally thought he was better in 1937’s A Star Is Born, and the film received five other Academy Awards too, including Best Picture. Above all, the story feels genuine, as if these were real stories that actually played out in the post-war period, even including how businesses and conspiracists viewed the war and the shaken people it sent back home. Despite being a significant film and one of the best in its genre, I do feel The Best Years of Our Lives, at 170 minutes, runs about twenty minutes too long, and not all three of its stories carry the same weight. Homer’s is easily the best with a profoundly lump-inducing conclusion, while Fred’s love triangle with his shallow wife (Virginia Mayo) and Al’s daughter Peggy (lovely Teresa Wright) has its moments. So does Al’s homecoming, but his drunkenness drags on a bit with little resolution, even if I’m sure it’s a true depiction of the way many veterans tried to cope. The Best Years of Our Lives may run long, but it’s a moving portrait of post-war America and the problems that plagued her veterans, which still ring true due to the permanence of war. One image near the end seems to capture the potential hopelessness of their situation, as Fred sits in the nose of a scrapped plane with no engines, grounded and heading nowhere. Yet it subtly says even more that right afterward, he learns the scrapyard will be recycled into new housing, a symbol of the renewal capable for men as well. Who wouldn’t think, “I’ve an idea to pursue! And train them to do what I want them to do. Or turn psycho, causing a hullabaloo? It’s not my fault if something bad should ensue. Who would think that? That’s right, very few. Considering I only saw it once years and years ago, I thought it was about time I reminded myself why The Dirty Dozen is so popular. After all, its memory brought Tom Hanks and Victor Garber to tears in Sleepless in Seattle. 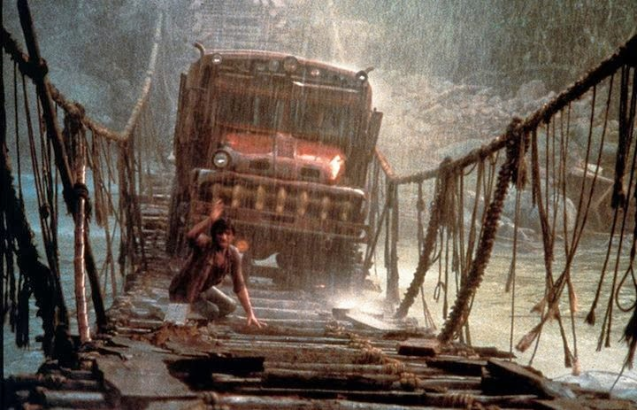 While it didn’t quite leave me choked up like them, I must admit it’s a unique classic of the war genre, full of surly machismo and a highly talented cast. And despite having practically the same basic premise, it’s way better than Suicide Squad. 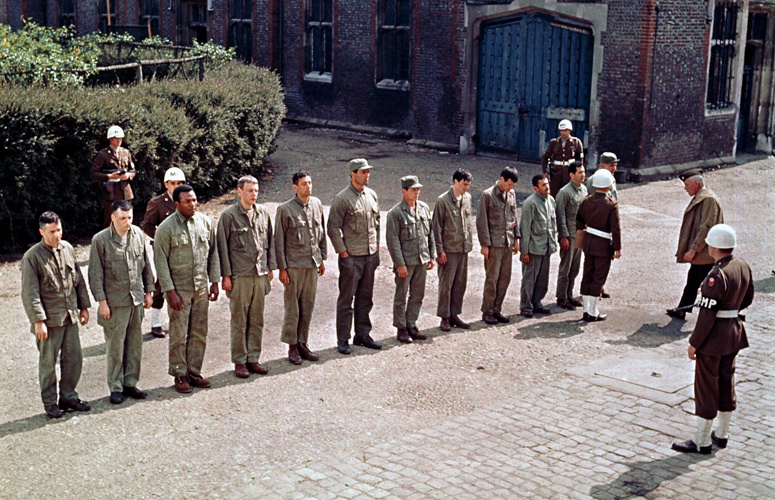 In the months leading up to D-Day, Lee Marvin’s Major Reisman is put in command of an experimental unit of twelve convicted prisoners, who are to be trained and sent on a probable suicide mission for the Allied cause. Half of them plucked from death row, this “Dirty Dozen,” as they’re later explicitly called, is full of murderers and rebels, and despite being offered amnesty if they survive, they aren’t about to become model soldiers overnight. Thus, the no-nonsense Reisman pulls no punches in whipping them into shape and encouraging them to work together for their own (and the army’s) best interest. The main thing I recalled from my first viewing was that I had trouble telling the men apart. Obviously, I could recognize Jim Brown as the only black member, but the others all blended together to the point that the deaths toward the end didn’t mean much to me since they were all interchangeable. While not everyone stood out this time either, I was better able to distinguish the actors I’d seen elsewhere, such as Donald Sutherland as Pinkley, Charles Bronson as Wladislaw, and John Cassavetes as Franko, plus Ernest Borgnine and George Kennedy as officers. Others stood out for their distinct personalities, such as Clint Walker’s shy Posey and Telly Savalas’s psycho Maggott. That’s still only half of the Dozen that I could pick out of a lineup from memory, but at least it’s better than my first go-round. When I ignored trying to tell the other six apart, I was able to just enjoy the movie, which starts out slow but gets better with time. Periodic humor keeps the tone relatively light, such as Pinkley impersonating a general, and although the Dozen are labeled as bad men, there were levels to their “dirtiness.” Some like Maggott with his religious zealotry were downright crazy, but others were simply high-strung and bitter in their defiance. A few even had mitigating circumstances to their crimes that made them more sympathetic than others. This was something that Suicide Squad didn’t do well in making all the villains psychopaths, along with some of the “good guys” too. There has to be someone the audience can sympathize with, and at least a few of the men in The Dirty Dozen were worth caring about. While the training and the war games scenes were rather fun to watch, the best part is the actual mission against the Nazis to which everything else builds. With the high body count and higher bullet count, this is war action at its best, even if I’m still not sure where and when everyone who died bit the dust. The film got a fair amount of criticism at the time for its violence, and I was a bit shocked too by the ruthlessness of killing both Nazi officers and their potentially innocent escorts, though I suppose such is war and the mission at hand. The Dirty Dozen lives up to its reputation as a “man’s movie,” but my VC enjoyed it too. Even with its large cast, it wrings plenty of excitement from the risk of its somewhat implausible but entertaining premise. And a long life ere the end. Having met your every goal. Is up to each of us to guess. Ingrid Bergman is one movie star who hasn’t been much on my classic film radar, aside from Casablanca and Gaslight (which are great). To remedy that, I decided to check out one of her later roles in the semi-epic The Inn of the Sixth Happiness, in which she plays Gladys Aylward, a real-life missionary to China who rose to fame with her humanitarian efforts during the Sino-Japanese War of the 1930s. I call it a semi-epic because, though it doesn’t quite boast the sweeping storytelling of Ben-Hur or Doctor Zhivago, there’s enough of it in Aylward’s decades-long mission that the magnitude of her story rises above others of its day. At the beginning, Aylward displays an indomitable passion for China, feeling it is where God has called her for His purposes, and at her own expense and peril, she journeys there to join an already established missionary (Athene Seyler). There in Yang Cheng, they open an inn for travelers, whose hunger for stories they plan to meet with the Bible, but many difficulties stand in the way, from uncooperative leaders to the obvious language barrier. And even when she earns the trust and love of the people, Aylward’s commitment to China also puts her in harm’s way when the Japanese invade in the years leading up to World War II, and she takes it upon herself to lead a hundred orphans to safety. While The Inn of the Sixth Happiness doesn’t quite make my List, it’s the kind of film that might have if I’d seen it long ago and built it up in my head as a classic. (That is how it works sometimes.) There’s much to love about it, not least of all is Bergman’s performance as Aylward. Even if she looks and sounds nothing like the woman she’s playing (just one of the film’s many historical liberties), she certainly captures her commitment and love for the Chinese people. Like Mother Teresa, she goes to serve as both servant and example rather than force conversion on the people. She doesn’t merely go to China for a couple years to fulfill a duty; instead, she immerses herself in the land and culture, even becoming a Chinese citizen, and dedicates her entire life to her mission of love and social reform. It is this kind of Christian commitment that is most persuasive, and when she does find success and respect in the eyes of both the Chinese and her fellow missionaries, it’s immensely satisfying and touching. I’ve even heard reports that playing such a godly woman led Ingrid Bergman to become a Christian. Strong supporting roles are filled by Curt Jurgens as a half-Chinese colonel and love interest and Robert Donat (his last film role before his death) as the local mandarin of Yang Cheng. Of course, neither actor is Chinese, leading to retroactive criticisms of the film for whitewashing, but they both are excellent still, especially Donat, and they’re not at all insulting like Mickey Rooney’s caricature in Breakfast at Tiffany’s. Plus, the vast majority of the cast are still played by Chinese actors, including many children from a Chinese community in Liverpool. Especially affecting is the commitment of Aylward’s two Chinese helpers who assist her along the way, as well as an emotional scene between Aylward and one of her adopted Chinese daughters. It’s not without its flaws, from an overlong runtime to some loose ends that are left unresolved by the end. Plus, it’s up to each viewer how much the historical changes bother you; Aylward herself wasn’t a fan of the film’s depiction of her or Curt Jurgens’ character. 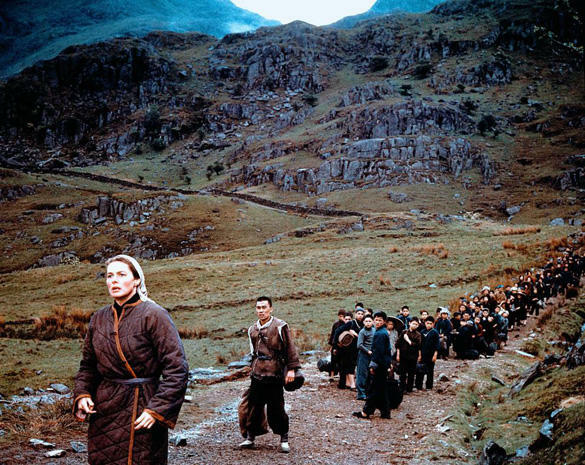 Yet the mountainous setting adds a good deal of authenticity to Aylward’s travails, aided by terrific cinematography, and even if director Mark Robson was the only member of the production to earn an Oscar nomination, the quality of the performances and overall film seem deserving of far more. The Inn of the Sixth Happiness isn’t strongly evangelical, still being a Hollywood production, but the faith of its subject is unmistakable and inspiring. Here is my contribution to MovieRob’s September Genre Grandeur of Remade Movies. 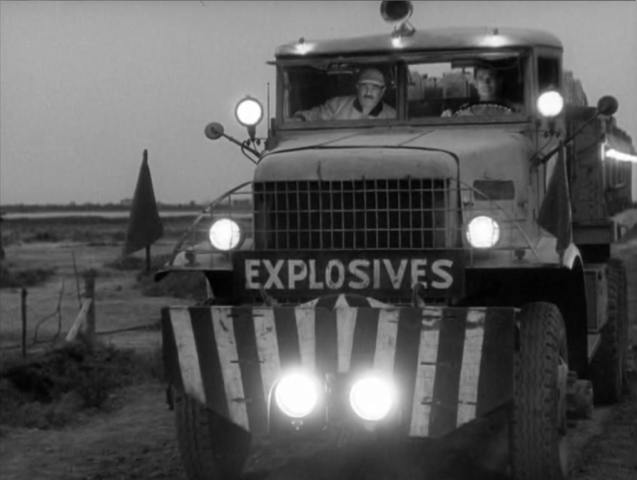 I reviewed both the classic French thriller The Wages of Fear with its American counterpart Sorcerer, comparing and contrasting them as one of my Version Variations. Thanks again to Robb of Red Bezzle for choosing this month’s genre. 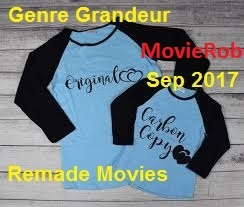 Next month’s Genre has been chosen by Kira of Film and TV 101 and it is Western CrossoverMovies. Literally any film from any genre with western elements to it; comedy/drama/musical or even thrillers or horror. Try to think out of the box! Great choice Kira! You don’t know what fear is, son. You’ve felt it flicker and then fade. The dark void of space is no friend or ally. Despite the expanses too vast for the eye. Mankind will dare every new height. It might seem that this story of a space shuttle mission gone wrong drew inspiration from the Apollo 13 incident, but surprisingly it came out shortly after Apollo 11, a year before the similar events of Apollo 13. Richard Crenna, Gene Hackman, and James Franciscus play the three NASA astronauts who are stranded in their capsule (called Ironman One) when main engine failure leaves them without enough fuel to return home or to their space station. Unable to do anything but conserve oxygen and wait, the astronauts rest their hopes on Mission Control, led by Gregory Peck’s flight director Charles Keith, and a daring last-ditch rescue mission. Marooned is still rather slow in its execution, but my mom has a special connection with any movie about NASA, this included, since my grandfather worked on the Mercury, Gemini, and Apollo missions at Cape Canaveral and she also worked there during the Space Shuttle Program. In fact, she sees her dad in Gregory Peck’s administrator and, as a kid, imagined her father similarly calling the shots, though he actually played more of a background role. I too have that fondness to some extent, which helped me appreciate Marooned more than I was expecting this time. One thing that I recognized with this viewing is how Marooned has influenced other stranded-in-space films. Ron Howard’s Apollo 13 is an obvious comparison, though that had a direct historical basis, while this is fictional. I could also point, though, to the rallying of support and resources for a risky rescue that was also seen in The Martian, and the emotional farewells between the astronauts and their wives were echoed in the video goodbyes of the space crew in Deep Impact. And of course, the desperate space-walking finale bears some resemblance to the whole concept of Gravity, though Gravity’s jaw-dropping effects make the Oscar-winning effects in Marooned look pitiful. (They’re decent, but at one point, I could see a string suspending a supposedly floating object.) In a way, this climax represents the problem with Marooned: it’s meant to be tense and gripping, but the now-hokey effects and lack of music (only space sounds) make it anticlimactic and far less engaging than it was meant to be, especially when we have films like Gravity that took similar ingredients and did them better. Yet I can’t be too hard on Marooned anymore. 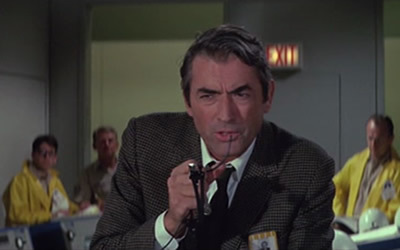 It does feature some excellent performances, exemplified in the tearful calls between the astronauts and their wives, and Gregory Peck is in top form. Plus, that investment in the space program that must be in my blood helped me appreciate it overall, especially Keith’s impassioned defense of space travel, regardless of regrettable losses incurred, making the scrapping of our modern space program all the more disappointing. It’s still a bit dry, procedural, and overlong for my taste, but Marooned has at least moved up in my estimation, which at least should make my mom happy.